We had bought SKS Microfinance on 16 Feb 16 at an entry price of 530. This was bought as the stock had started getting into the formation of higher top higher bottom on daily time frame. 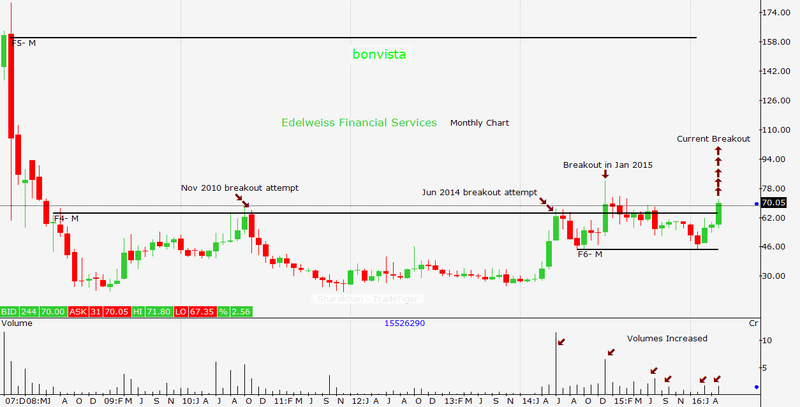 Also on monthly time frame the stock was about to breakout of rounding bottom formation. Here is an article I had written on SKS Microfinance on 25th April. Though, the stock has lot of steam still left and can further move up from here, I have exited from my portfolio of Prime Cash as my objective is met. My portfolio is basically a short to medium term portfolio and is run for quick gains in stocks. I have exited the stock at current level as there is a larger time frame resistance at current level. This zone is between 620-730. I feel stock will consolidate at current level before starting a further up move. Hence I have exited at a price of 635 on 30 May with the gains of 19.8%. Here is a snap shot of complete trade from my Portfolio Advisory System which is accessed by my paid subscribers. There is lot of debate on whether Technical Analysis really works, This is how I would put it. Its not only about Technical Analysis (or any other analysis for that matter) to make money in stock markets. There are so many other factors which are responsible for one to make or loose money. For example a portfolio framework, trading / investing discipline etc. The whole basket decides whether you will make money or not. I run this Model Portfolio Prime Cash for retail investors /traders in Indian stock markets. This portfolio has been dong well consistently. Nifty is currently trading in bull exhaustion phase. After long rally bulls prefer to rest and markets get into consolidation. On 15 min chart Nifty is seen forming a range. Ranges break on either side. Buying Nifty would be risky at this stage as Nifty is trading near resistance on daily chart. Aggressive traders may look to buy Nifty on breakout beyond 8200. Sell Nifty if it breaks below 8155. This trade can come with good rewards. Nifty is expected to open gap up in a supply (resistance) area. Nifty can experience selling pressure after opening today. Its too late to enter a buy trade in Nifty now. This is how one can trade Nifty today. Wait patiently for Nifty to give clear indication for first 15 min. If Nifty fails to sustain around 8200 levels, then aggressive traders can go short for some quick gains. Alternatively wait patiently for Nifty to come down to its support near 8080 to create long position. Markets run in cycles of expansion and contraction. There has been he expansion in terms of approx 300 points rally in last 2 trading sessions. Nifty is now trading near its resistance of 8090. PSU Banks in India have always been vulnerable to Govt Policies. Quarterly results produced a mixed set of performance. Sector Index has been falling consistently since Jan 2015. Though the overall market was also not been doing good from since the same date, the difference here is that, many other sectors have tried to bounce during better periods. 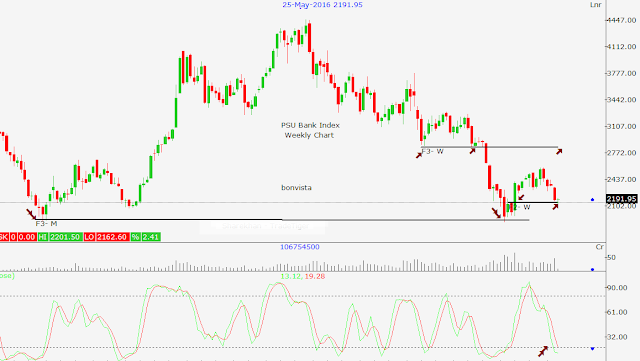 However for the similar periods the spike in PSU bank stock has been minimal barring some exceptions like SBI. From monthly chart enclosed here, you can see that PSU Bank Index is trading near its low of Feb 2016. Most Technical Indicators are oversold. The index chart is also trading near gap which was formed on 2 March 2016. 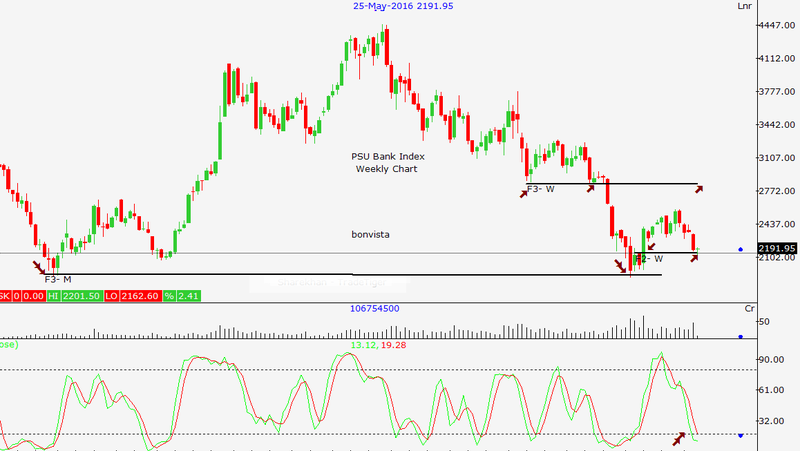 This suggests an expected demand level in most PSU Bank Stocks. On daily chart the Index chart showing a nice momentum. Next resistance is around 2300 which is 5% from here. On a little higher time frame the index can move up to 2900 levels in couple of months. That makes it an upside of 33% from current levels. Though charts and overall performance is currently not looking good, this can be treated as a contra bet. Well, Nifty is ready to break that long awaited level of 7940. We can expect Nifty to gap up above 7940 to get into new bullish territory. Next level of resistance is 7990. After long run up markets prefer to rest. Today can be one such day. Nifty can trade in a small range with bullish bias. Buy on dips. No short selling. First support is at 7925. Next is at 7880. Resistance is at 7960 and 7990. As discussed yesterday Nifty is not sustained at the higher levels. Also it was choppy through out the day. Choppy trading is expected to continue today as well. This behaviour of market is highly difficult to trade. More so due to F&O expiry. Nifty is still trading near support of 7710. Lets expect again a bounce from current levels today. Nifty has first resistance near 7750. Sell Nifty only in case it breaks below 7680. Till this point this market remains a buy on dip. Edelweiss Financial Services is one of the fastest growing financial services company. The company is serving in the areas of Corporate Credit, Insurance, Broking, Investment Banking and Wealth Management. The stock has been trading below levels of 63.5 since June 2008 until Jan 2015. This is a period of 7 years after it broke below in Jun 2008. Stock tried to break above price of 63.5 in Nov 2010 and then in Jun 2014. Both the attempts failed. This behaviour leads to a formation of Rounding Bottom pattern on Technical Charts. Rounding Bottom pattern suggest a long revival period after a major setback to a company. 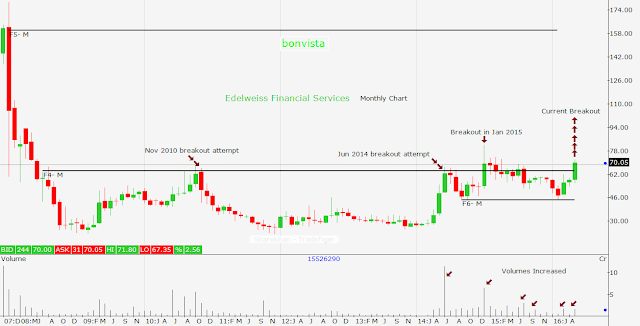 The process of revival was going on in case of Edelweiss since Jun 2008 till it broke out of 63.5 levels in Jan 2015. The breakouts in case of rounding bottom suggest that stock will gradually lead to its high price which was there just before it fell heavily prior the formation of rounding bottom. In case of Edelweiss this high is also an all time high at 179.50. After breaking out of resistance at 63.5 in Jan 2015 the stock could not sustain above it. We can attribute the reasons of non-sustenance to falls in broader Indian markets and global markets. As you can see on Monthly chart enclosed with this article, the stock is again trying to move above the resistance near 63.5. Today it is trading near Rs 70. For medium term buyers who are willing to wait for a period of 1-2 years the stock has potential to earn more that 100% returns from current level. I have also enclosed daily chart with support and resistance levels. Short term traders can buy this stock at current level and accumulate till levels of 62 (if it corrects till that level). In short term the stock has potential to reach to price of 98. That can gives us returns of 30%. Weak global cues and stringent measures on P-notes did not allow markets to break beyond resistance last week. Out of 5 trading sessions bulls have shown strength in 3 trading session to begin with, however they did not have courage to take prices further up and lost to the bears in last 2 trading sessions of the week. We are entering in F&O expiry week. Will this week decide the trend for next month? Technical Overview: Last week Nifty made a high of 7940 and low of 7735 to close at 7749. That was a range of 205 points. Bulls have lost all the gains they had earned in last to last week. Weekly candle closed near low with somewhat sluggish sentiments. The good news for bulls is that the Nifty is now trading near an important support. Nifty has filled up a gap near 7738. My View: If current broad trading range is to continue, Nifty need to give strong upward pullback from current level. There is high possibility that Nifty will recover in early trading session in next week.